Just a quick note about the header image we use on this site. At first glance, it looks like the top part of a palm tree. But, when you look a little bit closer, you notice that this tree is much higher than the surrounding trees. And the stem looks a bit weird: There´s a ladder on it! Yes, the fake palm leaves barely conceal the antennas of a mobile telephony base station. Once you know what antennas may look like, you start seeing them everywhere: On the roofs and walls of buildings, neatly mounted below the streetlamps or in the ceiling, right in front of your apartment´s entrance door. 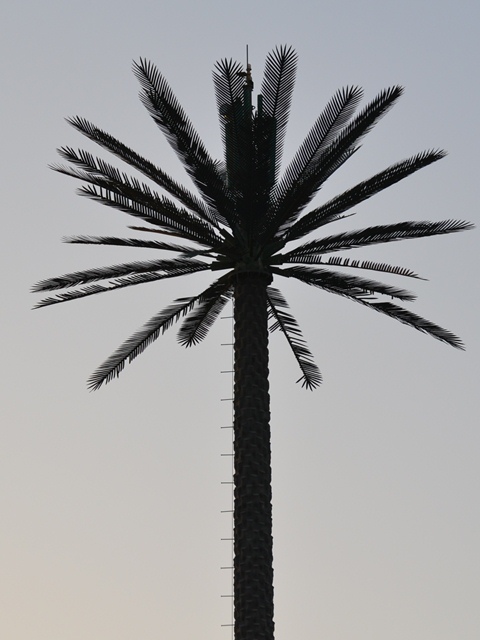 Behind the cut, I´ve put a relatively large photo from Dubai of a fake palm tree. This photo is from Dubai. GSM consultant with international experience. Specializing in Product and Project Management, Value Added Services and Number Portability.